love the clean lines of his tables. Gorgeous shop !!! The travel print - Moroccan - caught my eye.. but I really liked the ice-blue cashmere throw from the Himalayan collection. Oh wow, what beautiful stuff!! I love the dovecote - so unique! Thank you for your beautiful giveaway. Okay, so hard to choose. This is so my style. I really loved the Victor sofa, it has hint of a retro vibe with those buttoned back cushions, but I love the curve in the arm and the single seat cushion. Clean but glamorous. This lighting is just exquisite! I would love to have one of these. I am a follower and on facebook with you too! I can't wait to check out her blog. Eggshell Lighting is Fabulous!~ Wow! Love, love everything about Francine and her shop. I get my jolt of culture and am made so aware of her dedication to what she loves. Great giveaway, Karena. Am am a follower all around! Hi! Thanks for stopping by and leaving a comment. I'm entering your giveaway and I'm a follower! I LOVE the Agora Modular Seating...my dream is to have a piece like that in my backyard near my pool! First of all, many thanks for your lovely comment today. I love Francine and her shop 'Interieurs' is beautiul and filled with wonderful things.....I love all of the leather sofas, the lighting and , in particular, the antique items. Yes, of course I know of her company but had no idea that there were so many, many insanely beautiful pieces. What a fabulous imaginary shopping expedition I just had. I was going to choose the lovely Aura headboard but then was blown away by the "Life is Fragile" lamp. Very moving. Will look forward to discovering her blog. Have a great week! Great giveaway! I am your newest follower. That lamp is awesome! I checked out the shop and I also like the Travel Print - Nenuphars. So pretty! well i am liking what i see here! Gorgeous giveaway Karena! My fave is the eggshell lamp - but almost everything is very tasteful and gorgeous. Count me in! And have a happy week! We were just in NYC, and I wish we had popped over to see her store! I love the Industrial Side Table and Industrial Cart ... and anything that starts off with "Industrial"!! Great giveaway! I LOVE th antique dove cote!!! thanks for the opportunity to enter this giveaway!!! Ijust send you a friend request on FB!!! Looks like a lovely shop...the website is really well done. Love the table lamp. I'm a new follower. 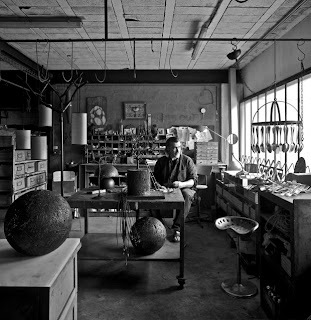 i love the caleb siemon orb pendants from her store. gorgeous. I love Francine's work - great person to profile!! 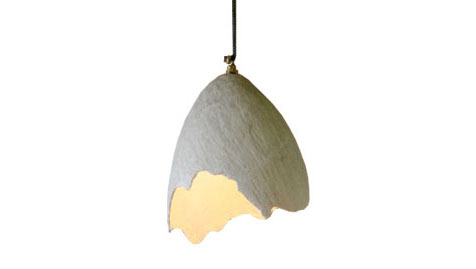 I love the eggshell light by Jose Esteves…really inspired. It reminds me of an exhibit I once saw with giant sculptures of paper. Incredibly beautiful, incredibly simple. First of all I would like to thank you for taking the time to visit and enter my Giveaway. I appreciate all of my visitors and love reading their comments. Second, I found Francine's Shop, Interieurs to be warm and beautiful. I love how she describes her style and uses her intuition, and finds inspiration in the things around her and not from a sketch pad. I am usually not a lover of jewel tone colors but, I found her Moroccan Lounge fascinating especially the sofa with all the gorgeous colors. I also love the Ethiopian Tombon lamp. I found her photos to be warm and inviting with a sense of stillness. Again, thank you so much. I am heading to FB to like your page. Hi Karena! 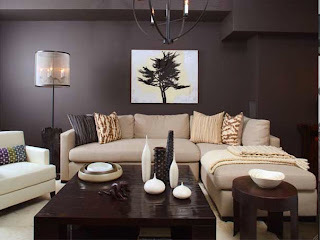 I'm a follower and I visited Interieurs and I loved the modern lamps..all of them actually :) And the brown sofa is so perfect! I'm off to visit her blog also. Have a nice day! I love the throw...so beautiful. Oh I hope I win your giveaway! Great to come and visit you again and thanks for coming by my blog. It was neat to discover Francine's blog and what an amazing shop she has. I love the Cocoon Pavilion and the eggshell lamp. Thanks so much for the heads up on your great giveaway! Oh my gosh! I LOVE the brocante chandelier! That is just too fab for words! LOL! What a statement piece! What a fabulous give a way! for quite a while now. I am truly honored when you pop in to visit my blog! The store is filled with brilliance! 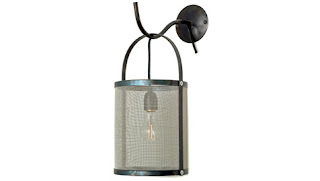 I love all of the industrial antiques...the mesh floor lamp is fabulous! That shop is just incredible! I love the rectangular pendant light! You always find the most fun things! Love her designs, I'm with Mona, too many goodies to pick a fave! Interiurs it's a paradise, lots of wonderful furniture and I like those Organic Form Clay Planters. 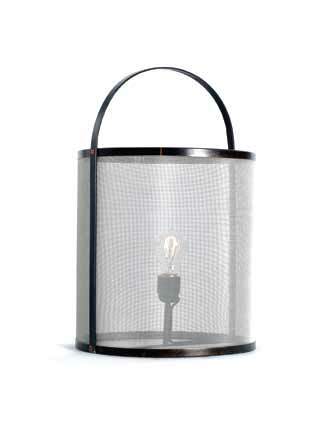 And I love this tabletop basket lamp! My favorite thing in Francine's shop is Francine!! I like the Brocante chandelier--I think that's the one with all the spoons. Its cold today and her cashmere throws are looking very good to me. thank you for sharing such lovely photos! Karena thank you for stopping by my Harvest Moon Post and letting me know about this generous give-away and also introducing me to this creative Stylist. 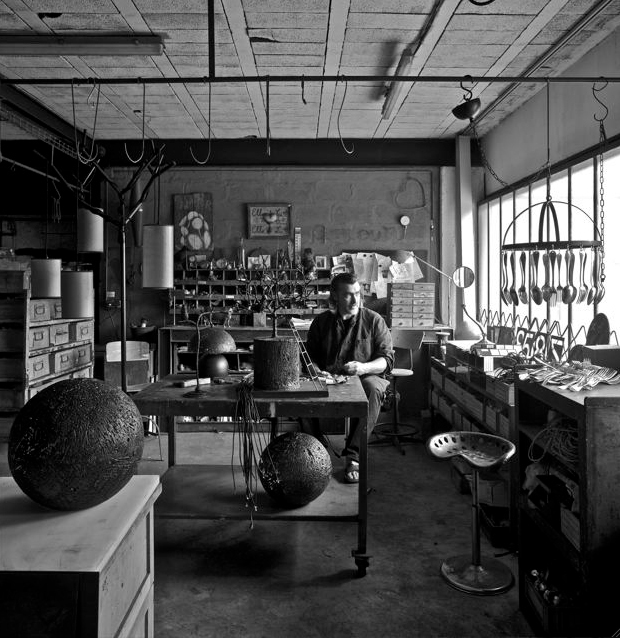 I really enjoyed their imaginative Industrial Style of Lighting Fixtures... something about that goes with almost any kind of decor so its very interesting and versatile. Hello Karena, it's wonderful to meet Francine. The Renversant armchair and ottoman looked heavenly to me, as I'm in need of a comfortable place to lay at the moment ;), it would be perfect! Thanks for the give-away. You bring on the best give-aways. What a beautiful shop. Thanks for the intro! Those throws sound really nice on this beautiful crisp fall morning! Thanks so much for dropping by! You introduced me to a whole new world!I love all the shops, Francine's gorgeous antiques especially. Following you, too. Beauiful...I always love seeing Francine's work! Just a PS...but I never heard from anyone about the Perricone giveaway I won. 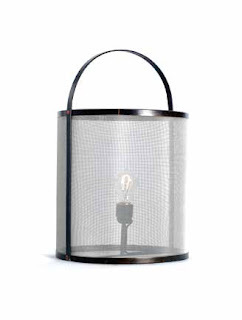 I love inventive lighting and the basket lamp is really cute and cool at the same time. Beautiful things! Thanks for sharing! Francine has a lovely shop - lots of beautiful things. Thanks for the introduction. Love both - Francine's interior and Jose's work! Very interesting post, thank you for all the information. Thank you for your generous words to my hats and wishing you wonderful Monday! Thank you, Karena for this great giveaway and for letting me know about it! I'm loving her shop! It has so many stunning accessories. My favorite thing is that eggshell lighting by Jose Esteves. He's so talented! Almost too much to pinpoint one thing. Great giveaway! Love the clean lines and tranquility of it all. I'm also a follower here and on twitter. you won my giveaway! email me for details! What a great giveaway. I love the industrial side cabinet. I remember when they had a smaller showroom in soho years ago, still remember the gold fish tank inside an antique bird cage~ such original display! Much love to you, Karena! HAMPTONS L-SHAPE Lounge chair - Depth 39.25 Collection: Modénature, Made in France. It is gorgeous! So many great pieces! thank you Karena for the giveaway! I follow Art by Karena. There is so much beauty here that it is impossible to choose. Love her designs - they're both modern but have that personal touch. The lamps are stunning too. I don't think I"ve ever seen anything that unique before - especially loving the eggshell one! I love Francine's work and her shop! My faves are always the industrial antique stuff - metal french chairs, wire baskets, that kind of stuff. I could spend a fortune in her shop! I LOVE the cabin light wall light in copper!!! Ooh, what exquisite interiors! I really love the travel prints! I must go to visit Interieurs! I really need to meet her and see her shop! I love the Belle-Ile Chandelier!!! Karena, that is an amazing lamp! You're right, it would look wonderful in a variety of decors. 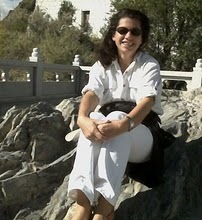 thank you for visiting my blog, your words brighten my day! what impeccable taste in decor- please count me in for the very generous giveaway! Great giveaway, Karena. Love the fragment table lamp (but really, everything is very unique in that shop). Take care, darling! I'm glad to be back in blogland and to get a chance to come visit you. Great giveaway Karena! I love the eggshell light. It is so unique and creative. I follow you here and on facebook. The entire website is gorgeous, but that industrial metal desk is really to die for. 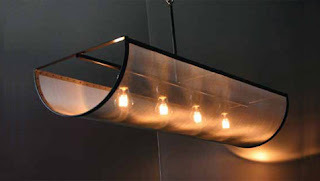 Really beautiful one of a kind lighting pieces also. and i friended you on facebook! I am your follower on GFC! Love the banded orb pendant in amber! So many gorgeous furnishings! Lovely giveaway! P/S: Come by and enter my giveaway for a chance to win a stylish book by Kerrie Hess: 'Shoestring Chic'! am also your friend on facebook Karen! have a lovely weekend! I'm a follower/friend. What a nice giveaway! I love her shop. Went browsing and the Brocante chandy is ingenious! I'm in Heaven!!! I must say I fell for all Jose's lamps in The Curiosities Collection....The Spine Branch lamp would be perfect in my home. Thank you for this wonderful giveaway!! Love, Love, Love everything about your blog. I am also in love with that barcart with the steel top on Interieurs. Thanks for the opportunity!! I would love if you would follow my blog as well. Such lovely designers! Thank you for the chance to win Jose's beautiful basket lamp. Such a great piece and I have just the spot for it. I have a a bit of a crush on metal. I am a follower, Karena! What wouldn't you love in Francine's shop? If I had to choose favorites, I'd choose the basket lamp above, the Jose's Minimalist Sconce and the Charlotte Sofa. SIMPLY gorgeous. Thank you. I now follow you on Twitter, too! Retweeting giveaway. Would love to win Jose's functional work of art. I love the library books she has in her store, but the antique dove cote is a fascinating piece...imagine the conversations it would generate! Love Jose's elegant lamp collection. In Interieurs, I like the outdoor furniture, Eden especially. Am a follower of this blog and follow you on Twitter. Here site is elegant and beautiful. And welcoming. I just went to your Fb page and hope to follow you. cheers! Just got connected to the Internet and read your post on Jose and Interieurs. A million thanks! I just read all the comments. Down from the amazing mountain and warming up in exotic Zanzibar. Back home soon. too soon!